As Antarctica has never been permanently settled by humans, there has historically been little military activity in the Antarctic. Because the Antarctic Treaty, which came into effect on June 23, 1961, bans military activity in Antarctica, military personnel and equipment may only be used for scientific research or any other peaceful purpose (such as delivering supplies) on the continent. The Antarctic Treaty specifically prohibits military activity on land or ice shelves below 60°S. While the use of nuclear weapons is absolutely prohibited, the Treaty does not apply to naval activity within these bounds (in the Southern Ocean) so long as it takes place on the high seas. The Australian auxiliary HMAS Wyatt Earp made an unsuccessful voyage to Antarctica in 1948. 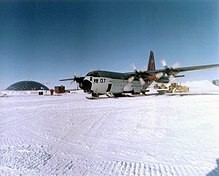 In January 2006, a Royal New Zealand Air Force P-3K Orion maritime patrol aircraft conducted a trial flight to and from Pegasus Airfield near McMurdo Station to determine the feasibility of conducting patrols from Antarctica in support of the Convention for the Conservation of Antarctic Marine Living Resources. RNZAF P-3Ks have regularly conducted flights to and from Antarctica since this successful trial. John Keegan and Andrew Wheatcroft, in their 1986 book Zones of Conflict: An Atlas of Future Wars, make the point that strategic interests in Antarctica derive from two causes: economic and strategic. Antarctica has great potential economic value, in terms of mineral and oil resources. Strategically, there was continuing concern about keeping the Cape Horn route available for free passage during the Cold War, as, among other things, U.S. aircraft carriers cannot pass through the Panama Canal. The Falkland Islands, Keegan and Wheatcroft go on to say, dominate the Drake Passage, the 'stretch of stormy water separating South America from the Antarctic'. This was a less publicised factor during the Falklands War. However, with the dissolution of the Soviet Union, and increasing competition for fossil fuel resources, the 'economic' rather than the 'strategic' rationale will likely grow more important in the early twenty-first century. ^ Wikisource. "Antarctic Treaty". Retrieved 2007-01-21. ^ Asmussen, John. "Hilfskreuzer (Auxiliary Cruiser) Komet". Retrieved 2007-01-21. ^ "HMAS Wyatt Earp". Sea Power Centre Australia. Retrieved 2008-09-16. ^ "RNZAF Orion Lands on Antarctica" (Press release). New Zealand Defence Force. 17 January 2006. Retrieved 2007-01-25. ^ "Air Force conducts early ice flight" (Press release). New Zealand Defence Force. 2008-10-30. Retrieved 2008-10-31. ^ Keegan, John; Andrew Wheatcroft (1986). Zones of Conflict: An Atlas of Future Wars. New York: Simon and Schuster. ISBN 0-671-60115-6. ^ Bergin, Anthony (20 February 2007). "Six reasons Antarctica is crucial". Australian Financial Review. p. 63. This page was last edited on 22 March 2019, at 00:06 (UTC).